Less Waiting. More Care. Less Spending. Better Health. See Recent Reviews & Review Us On Google and Yelp! *Please note - Practitioners take a required daily lunch break from approximately 2-2:30pm on weekdays. Please note that lunch times are approximate and may vary due to patient volume. Thank you for your patience. The cash price for a larger clinic visit alone will cost you $230-$340 excluding test/procedures. With procedures, your typical medical bill ends up being $400-$550. We are less than half that cost! View our price list now. Carolina Express Clinic gives you a faster and far less expensive alternative to waiting in an overcrowded emergency room. Our goal is to see patients who are 18 months and older within 10-20 minutes of arrival. No appointment necessary. If the wait will be longer, we'll tell you. This way you can leave and come back if you'd like. 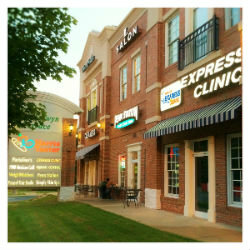 We offer quality medical care for you and your family in a clean, inviting environment. With your permission, we share reports with your primary care physician so there is no gap in your records. As part of the Charlotte community, when your healthcare needs exceed our services, we connect you to advanced medical resources. Our team of expert providers care for you, your health, and your well-being. Practitioners take a required daily lunch break from approximately 2-2:30pm on weekdays. Please note that lunch times are approximate and may vary due to patient volume. Thank you for your patience. If you have a chronic infection or an immune disorder, you may need additional diagnostic testing and further care not available at our clinic. Carolina Express Clinic provides treatment for mild to moderate illnesses, offers preventative care, and management of chronic illnesses, but is not equipped to treat major medical emergencies or traumas.